HOPE OR NOPE: The War on Debt, err, Drugs! "In questioning during Congressional hearings related to her nomination, Napolitano spoke in favor of the militarization of the Mexican border, saying that border fences should be used to separate urban areas from Mexico, but that higher technology should be used in the more remote expanses of the border area. 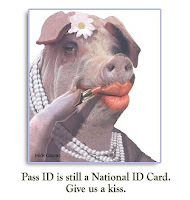 She did not oppose the “Real ID program,” which would create an internal passport system in the US, saying only that the financial burden it will impose on states needs to be lessened." We, the People of the United States, in order to form a more perfect union need to get out of the foreign relations business for just a minute to mind the store internally. We just managed to extract the thumbscrews and the sensory deprivation equipment off of people living at Guantanamo Bay. 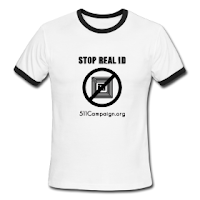 If we look again, we see The Real ID program is an embarrassment to U.S. identity. It says we can't manage ourselves without a digital chaperone. The chaperone may make a lot of money in the public-private partnership. However, when the whole of the US economy is having a tough time squeezing nickles out of the Fed .... it's obvious; we have a long way to go. My intuitive guess with the blowups in Juarez, aptly timed for new presidential accompli, has as much to do with economic hardship as it does with our last president's confusing blitz of legislation that goes against the Republican base's demands for small government and our needs for fiscal conservatism NOW more than ever. As of today, El Paso Texas is not in a state of emergency even if Juarez, Mexico is. Can we keep it that way? What else are the chemtrails skywriting out other than DIRECTIVE 51 and CONTINUITY OF GOVERNMENT? The Department of Homeland Security cannot "take it to the next level" without a national federal emergency. In times of federal emergency, NPSD 20 overrides whatever constitutional rights you are under the impression you possess. Whatever you do - don't believe the hype. Agitprop in the form of CNN's Lou Dobbs has been setting up the staging for a faux flag attack strategy for over 10 months. The violence is real. It is just really contrived. I do not trust that FEMA prison camps are collecting dust in the deserts at a collective loss to provisos. Prisoners have little to no rights in this country. Most Americans do what they can to avoid imprisonment. However, if you are running a drug cartel, like Manuel Noriega, you can be imprisioned in America. From there you can put together car stereos, do data entry, field collection calls from creditors, process purchase orders for China, assemble electronic motherboards etc. etc. Whatever it takes to pay back your "debt to society". WE NEED FREE LABOR!! And we will get it one way or another. This country was built on the sweat of rich delusional men and their dehumanizing entitlements. I will say it now, before it becomes the next eventuality; and for the sake of human dignity, so that it won't. The trouble is, 10 trillion is a lot of debt and Americans aren't good for it. So here is the #1 question to answer the electric company before they shut you down...how am I going to pay for this? My hope, my real hope, is that we can live without debt. To live without debt is to get a whole other economic way of life altogether. This is apart from the intricately incestuous International Monetary Fund and World Banking System. It comes on the terms of the community. A gold standard perhaps. Maybe it means reevaluating the monetary systems in terms of community currencies - sustainable by green economic growth, urban rooftop farmers who can provide surplusses to neighboring counties with smaller ways and means. However, we come by it, it might be time to give up the ghost on America's plan for internment in the states to get our needs met. That was never a good idea. We can do different and better and we should. To withhold certain highway funds if a State does not comply with certain requirements in issuing a driver's license or identification card, and for other purposes.